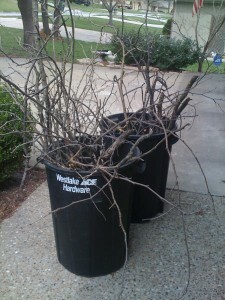 After a big wind the other night, I went shopping in my yard and came up with a little equation. 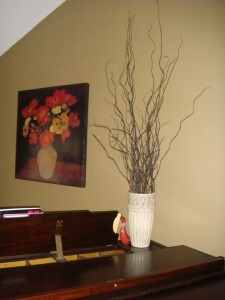 = perfect decor to add to a vase and bring height to a room! I also cut off some more amazingly beautiful and colorful pianis to add to my happy sink flower collection. …looks expensive but cost me, zero dollars! 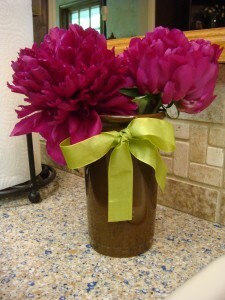 Thanks to Wendy @ Shabby Nest for hosting another wonderful Frugal Friday Party! My First Giveaway and Etsy Store Announcement! I just love FREE decor…and spray paint! Thanks for linking! Gotta love the price - you can’t beat that! How clever! Love the flowers! 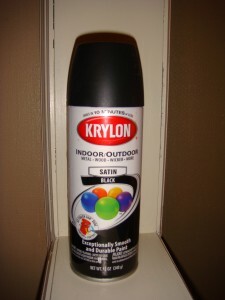 Oh Krylon Black Satin spraypaint, how I love thee! Love your ideas! Nothing’s better than free and spray paint! Now, I love me a $0 budget! I may have to try painting the twigs! thanks for sharing your fabulous idea. Great ideas! Thanks for sharing! Spray paint can do some amazing things!